Idle Thoughts | Rants, Raves, and Revelations . . . oh my! Rants, Raves, and Revelations . . . oh my! Another story I wrote for a nonfiction writing class in college that I’m posting for a class I’m teaching. When most people think of being lifted to greater heights, they talk about emotional things – love, enlightenment, winning an award, someone making them feel better about themselves or something they’ve done. I do, too, but having been taken to greater heights quite literally, I’ve learned to look at it in a whole new way. In short, driving will never be cool again. Now, don’t get me wrong, I still love to drive, but nothing will be able to compare with what I had the chance to do one night in early September 2010. I was taking a videography class to complete my journalism degree and was tasked with the final assignment of coming up with a story and editing it together into a package. I was going to do something basic, like the process of baking a cake or something, but then a friend of mine, Linda, gave me an amazing idea. Linda’s dad is a mechanic at the Muncie airport, working primarily with the autopilot systems in small private planes. He also happens to have his own plane. How many of my classmates would be able to do something like this for their project? And how cool would it be to go flying? I hadn’t been in a plane of any kind since I was fifteen years old, when my grandmother, brother, and I went out to Utah to visit my cousins. I had loved it then and was sure I’d love it now. After church, I followed Ken and Patrick, a boy who rode on our bus route, out to the Muncie airport. It was starting to get dark and I was desperately hoping to have enough light for some decent footage. We got out of our cars and I started gathering my equipment – my camera, voice recorder, and cell phone (which remained off for the flight) – while Ken opened the hangar door, which had a smaller, vertically-opening door in one of the horizontal panels of the hangar door. In the hangar stood a 1956 V-Tail Beechcraft Bonanza, painted mostly white with red and blue stripes. When he asked me what year I thought it was, I guessed 1998. It was in incredible shape! It sat four skinny people comfortably and had little blue curtains on the back windows. We climbed in, careful to avoid stepping anywhere near the flaps, as much as could be achieved. I got my camera out and video taped his hands checking his instruments, praying my camera’s microphone was catching what he was saying. We headed toward the runway and before I know it, we’re airborne. The view was amazing. It was sunset and the last vestiges of the sun turned the sky to the west brilliant shades of pinks and oranges. We could make out Ball State and Patrick’s house and other landmarks like tiny models beneath us. As the sun set even lower, Ken asked a puzzling question. Well, no, no I haven’t. He dropped altitude a bit until we couldn’t see the sun off to our right anymore and then shot upwards, effectively causing the illusion of seeing the sun set and rise again. He repeated the process twice before sun had sunk to the point where we couldn’t do it anymore. We flew around for a bit before we spotted the Prairie Creek Reservoir. This was when Ken started telling me how to steer the plane. I thought he was just imparting information, and, as it turned out, I was really glad I had been listening. I nodded and my heart rate sped up. My body knew what was coming, even if my mind, inexplicably, hadn’t figured it out yet. You’ve got to be kidding. He knew I didn’t have my pilot’s license, right? I grabbed the controls. I couldn’t believe it. I was flying a freaking plane! We made our way in a slow circle around the reservoir and flew a little ways before Ken took the controls again. I was on a high for the rest of the night. We flew around for a while, with Patrick getting a turn at the controls. The boy couldn’t be much more than eleven, but he was a natural, sitting on Ken’s lap so he could see through the windshield. I think his lack of experience with vehicles, on-the-road or otherwise, made him less nervous. His face lit up like an electric light, a huge smile filling his face, as he turned the plane left and right, up and down. Ken pointed to the screen of the GPS system, showing us where the plane was and where the airport was located. Was he honestly going to let Patrick land? I couldn’t tell. A natural pilot he may have been, but I was far from trusting my life to a child. Ken would tell me later that he had landed planes in far more precarious situations than this one (with one engine, with no working landing gear, etc) and I would have been terrified in that situation, with an accomplished pilot. This plane was in great condition and I breathed a silent sigh of relief when Ken finally took the plane back and Patrick climbed back into his seat in the back and buckled his seatbelt. We glided in to land, wheels kissing the ground without so much as a jolt. If I hadn’t seen outside the window, I would have thought we were still in the air. Ken taxied back to the hangar and put the plane back before taking us on a tour around to where he worked in another building and showed us more of the planes that were still being worked on. A US Air Force plane was being gutted and refurbished in its own room. Some of the planes in the hangar were only a few years old, but some, like Ken’s were old hands at flight, but they shone just as brightly as the newer ones that sat beside them. I’ll have to use that for a metaphor later. The drive home was about as anti-climactic as it could get. How do you just drive when less than an hour before, you were flying over the city and watching the sun set from miles in the air? I drove home with a goofy grin all over my face, still high on the experience. The next time Ken needs a flight buddy, I call dibs. I really want my pilot’s license now. I wrote this back in college as part of a nonfiction class. I’m posting it here so I can link to it for a class I’m teaching. In the days leading up to March 21, 2008, things weren’t looking too bad for Garth Rector. He and his wife were in the process of reconciling a separation and his family had been planning for more than a year to take a trip out to California to see his sister, Marty, retire from the military. His teenage daughter, April, his wife and other sister, both named Angie, were already there. The plan was for him to fly down to Atlanta to meet his parents, who were flying up from Florida, and then fly with them out west. That day after work, he arrived home around quarter to three in the afternoon, just like he did every day. Except this time, someone unexpected and unpleasant was waiting for him. Garth’s sister, Marty, was the one who received the call telling her that her brother had been murdered and was unfortunate enough to be the one to bear this news to the rest of her family, including her parents, who were still in Florida, waiting to leave to meet their son. The Rector families caught the first flights back to Muncie. I’m talking to her on the phone during a preliminary interview for a preview of Garth Walk I’m writing for the Ball State Daily News. Her voice is shaking and I feel awful for asking her to talk about this event in her life. That’s one of the things I hate about this profession – making people rehash stuff like this. Does the public really need to know this kind of thing? Do I have to open those old wounds that, while are far from being healed, are doing their best to recover? I feel like the journalists you see on cop shows, poking their noses and notepads into everyone else’s pain to get the best quotes for tomorrow’s newspaper. It’s a Wednesday, late in the morning, and I’m sitting in the newsroom, plugging one ear and holding my phone up with my right shoulder, scribbling frantically in my notebook in a desperate attempt to get her quotes right and listen to what she is saying. Other people in the newsroom are talking, sometimes loudly (sportswriters), making it difficult to concentrate. I would have loved to yell at everyone, “Shut up, can’t you see I’m on the phone?” but I’m just a rookie here and everyone else has been on staff for at least a year, if not longer. Until I gain some kind of seniority, I don’t get to make demands. Angie continues, telling me she has been organizing events like the Garth Memorial Walk during this and the last two Octobers to hold on to her brother’s memory and raise awareness for families like hers who must now live without someone because of someone else’s hatred. She shares two reasons for her dedication – she wants to know who killed her brother and she feels that someone sometime will come forward either at the events or because of them. She wants people to know they can be protected if they speak up and even have the opportunity to win the $10,000 reward she raised during Garth Fest, a concert held five months after her brother’s death. Her other reason is for her family, her parents in particular. She wants her parents to be able to talk to others who have suffered as they have. The night before the walk, I check the weather for the next day on my phone. Cold and rainy. I go to bed desperately hoping the weatherman is wrong, as I will be spending most of my day outside. No such luck. At seven the next morning, I awake to dark gray skies and head over to the Farmer’s Market to take pictures for a photography assignment. As the morning wears on, it gets colder and begins to drizzle, and my fingers grow numb from holding my hands out to take the pictures. By the time noon rolls around, there is a steady rain and it’s cold even inside and I am hoping that, while the event is important and needs to take place, the walk might be bumped to the next weekend. While thawing between the Farmer’s Market and the Walk, I text Angie, who confirms the time and location. It’s still being held that day at the fieldhouse at Muncie Central High School. Rain or shine. And so we gather almost an hour later, a single journalist and her photographer, three speakers, a lead investigator, the Rector family and around one hundred others, underneath a pavilion outside the fieldhouse at one in the downcast afternoon. There are nowhere near the people who had shown interest in the walk in the weeks previously, but Angie simply shrugs and attributes it to the weather. Looking around, it occurs to me that the weather doesn’t seem as appropriate as I thought it would. The people standing around me are laughing and chatting animatedly, garbed in Garth Walk t-shirts or shirts they made themselves featuring loved ones lost. True, there are some tears, but all in all, these people seem to be happy, or at least not despondent. I can’t tell if they were just coping remarkably well or if they’re hiding their feelings, determined to make this a good experience when they still felt like breaking down. It surprises me, but makes things less awkward. I don’t know if they were all members of an organized support group, but they all seem to know each other, calling each other by name and hugging like family. This of course, makes up for the lack of awkwardness I felt by the lack of tears. Members and close friends of the Rector family are handing out free t-shirts and announcing what seems like hundreds of times that people present should sign the guestbook. Some others set up speakers and other audio equipment. Two men set up a canvas hanging of the photo I had seen in old newspaper articles from the Muncie Star Press and the Indy Star. The man on the canvas banner is a handsome guy with salt and pepper hair and an inviting face, scarred from a car accident his sister would tell me about later. Angie says she had been concerned Garth might worry about those scars, but he never did. He was alive and called his wife, who was also badly injured in the accident, his angel. It changed their relationship, she said, even though they still had some problems. From what I can see of him, he appears to have been a well-built guy, stocky but not chunky. Angie tells me he was very athletic and involved with the Muncie Central wrestling team. Garth was the kind of guy you’d want as your next-door neighbor. And now he’s gone. Stolen from the world by a gunman (or woman) with a score to settle. Or maybe there was no score. Maybe they just didn’t like him. Maybe he just represented something they hated or would never have. Until the shooter is caught, I suppose the world and his family will never know. I never even met the man – he was killed before I came to Muncie – and even I mourn him. I am leaning with my back against one of the wooden posts of the pavilion, doing my best to stay out of the way while remaining close enough to the action to keep myself and my equipment from being rained on. I’m supposed to be observing and recording, not getting involved, though I am tempted to help hand out t-shirts or something. I feel terrible just waiting, not doing anything. I’m not used to being so still when I’m surrounded by such a flurry of activity. At one o’clock, Angie introduces her family and the first two speakers, Marwin Strong, a youth minister and Delaware County Building Commissioner, and Rev. Rory Bond, a chaplain with the Delaware County Sheriff’s department. I know him better as Pastor Rory, an assistant pastor at the church I go to in Muncie. He had brought his fourth grade son, Jared, who hangs out with me as I wait for the event to start. He keeps pestering me to talk in my Smeagol voice and to ask one of the organizers if he could have a doughnut from the box someone had brought. I tell him to ask the guy holding them, passing them out to some of the other kids, but he is too shy to ask himself, and I finally give in. As a youth minister in some of the rougher areas of town, Marwin is no stranger to violent crime. He tells a story of a young man, killed by a stray bullet while trying to avoid a fight on his way home one evening. The boy he’s talking about sounds like someone with such potential. A basketball player, with decent grades and a cheerful attitude, just trying to get home after dark without getting into trouble. I haven’t researched the situation and I don’t know the family, but I am pretty good at visualization. I imagine a mother coming to the door to see two police officers, maybe a chaplain, too, and breaking into tears, falling to the floor when they tell her that her son is dead, shot just trying to come home. I imagine a younger brother or sister, standing immobile in the living room, tears rolling down his or her cheeks as they see Mom fall to the ground in grief and horror at the news. Maybe the sibling was numb, not tearful. How would that change things? Would it change anything at all? It strikes me then that so often, it is this kind of person who is lost to violent crime. The people so innocent, they don’t necessarily think to watch their backs are the ones to end up with targets between their shoulder blades. It’s hard, at least for me, to feel pity for gang members who die at the hands of another gang, but this boy, only about fifteen or sixteen when he was killed, had done nothing to warrant it. I look over at Jared, who is standing next to his dad now, licking the last of the doughnut glaze from his fingers. He is younger than the boy Marwin is talking about, certainly, but I know kids like him – whose only crime would be to be in the wrong place at the wrong time – are suffering and dying because someone else wants to play God, choosing who will live and who will not. Pastor Rory gets up and speaks next, talking about the first funeral recorded in Scripture. It wasn’t sickness or death of old age – it was murder. Cain killed Abel over a petty disagreement with God after his brother offered the right sacrifice and God didn’t accept his own. God then vowed vengeance on Cain for his innocent brother’s death, sentencing him to wander the world with a visible mark not only protecting him from human retribution, but also marking him as a murderer for life. He talks about how God’s promise to avenge the innocent in His own time extends to the murders of today. Garth’s murderer and the murderers of the others being remembered by those present will be found out one day and will pay for their crimes. I can’t tell if his words give anyone comfort there. Sure, some, if not all, of these people want vengeance, but I’m sure they would much rather have their fathers, mothers, sons, daughters, and friends with them. However, I hope that the promise of justice is something they can latch onto, regardless of their individual religious beliefs. I look around as he’s talking. There are tears flowing from many faces, representing stories that have yet to be told, if they ever will be. Some people, I’ve been told, are walking in memory of someone who died peacefully. I don’t know how I can say someone died of cancer peacefully or they died in a car accident peacefully. Cancer attacks like a monster and the crash of metal on metal is far from a gentle way to go. Perhaps a better description would be “not from violence”. Even these have a story. People living everyday lives to have them cut short, leaving their loved ones behind. Friends, family members, hey, for all I know, there are people out there mourning these fallen who had never even met them or had the chance to let them know they cared. It is often said that we should tell people we care about them whenever we can, because we don’t know when the last time we’ll see them will be. How many chances have I missed? I have been fortunate enough not to have lost very many people in my life, but how am I to know what the future will hold? How many of these people blissfully gave up their last chance to tell someone they loved them, never thinking that the next time they would see them would be in a casket at a funeral home? The walkers start off on their journey from the fieldhouse to Minnetrista, the cluster of mansions once owned by the Ball family, and back, leaving behind a few people who would not be able to stand the walk and weather conditions. Among them is a blonde woman in a pink sweater and jeans. She is wearing a round button on her shirt with the picture of a brown-haired girl smiling out at me. The woman is Susan Teegarden. Her daughter, Heather, was murdered in her downtown Muncie apartment eleven years ago. Heather was only nineteen at the time. In her speech after the walk, Susan’s other daughter, Savannah Teegarden, Miss Ball State 2010, tells those assembled her sister’s story. On February 2, 1999, Heather’s apartment’s furnace had broken and, in an effort to escape the oppressive heat of her apartment, she had opened her back door. A man named Louis Verner entered the apartment, raped, strangled, and murdered her. “It kills me today to even think about it. I’m twenty-one and I remember being nine years old when it happened and I remember thinking ‘Heather lived a really long life.’ Nineteen seemed so much older than what I was at that time and I really didn’t think anything of it, and now being twenty-one, I’m, like, ‘Wow, I haven’t even started my life.’ I haven’t thought about the man I’m going to marry, I haven’t thought about my kids, I haven’t thought about any of that, and that’s something that Heather will never get the chance to do.” Savannah says, her voice shaking at the end. I can’t imagine what it would be like to lose someone this way and then come out and talk about it, even at venues like this. I assume her near-flawless delivery of these facts is due in large part to her having gone over it time after time to counselors, friends, and others that it’s easier to get the words out now. However, I can’t help but think about how it would feel for me to be standing where she is, an umbrella over her head, talking to about a hundred people about the gruesome murder of her sister. I know my throat would have closed up for sure. I would have broken down. This girl is so much stronger than me. The Teegardens had to wait nearly four years before Verner was found. Susan has a theory about why her family was allowed to wait for so long. Verner is currently serving life without parole. One part of Garth Walk I have been looking forward to most is the balloon launch. I have seen these before and they stand as a truly touching and beautiful experience, especially for those grieving for loved ones. There is a stack of cards on one of the picnic tables in the pavilion that has been blowing about for much of the afternoon, sitting next to boxes of green ink pens that don’t write very well after being out in the cold for hours. As they arrive back at the pavilion, people take the cards, writing messages to their loved ones departed. On the back of the cards a label sticker makes its plea – if anyone has any information about the Rector murder, please call Kurt Walthaur at the Delaware County Sheriff’s Department. While volunteers bring in the deep purple balloons to tie the messages to, the man controlling the sound system plays the song “I Can Only Imagine” by Christian band MercyMe, a song Angie says she chose to represent her brother. I don’t know how I can tell with the rain coming down – the gentle shaking of the shoulders, the wiping of eyes, the sniffles? – but this is when tears really start flowing, both for the people in attendance and for myself. The emotion is almost palpable, weighing on the area like a wet quilt, and it breaks my heart. There is so much pain here and, for some, it’s the only place they can let it show, among so many others who know exactly what they’re going through. Most of us have lost someone to something – old age, accidents, illnesses – but watching these people cements my belief that there is a special bond between those who have lost someone to murder that those of us who are lucky enough not to have experienced that tragedy will never have or be able to understand. People don’t need to say anything – everyone knows what each other is thinking. It is a world and an experience I am shut out from, despite my presence. “Surrounded by Your glory, what will my heart feel? Will I dance for You, Jesus, or in awe of You be still? Will I stand in Your presence or to my knees will I fall? Will I sing hallelujah? Will I be able to speak at all? I imagine the scene in their minds of balloons and the messages reaching loved ones in heaven, drifting right up through the clouds to the pearly gates, where their loved ones, aware of the incoming mail, are waiting to receive the words of those they left behind. I imagine there’s a solace there, feeling that their words are reaching them, all the things they forgot or didn’t feel the need to say can still able to be said, via balloon mail. Personally, I like to think the solace is accompanied by the feeling of the departed responding, giving comfort, however distant. During the song and launch, very little is spoken aside from the three-second countdown. Tears are shed, but people are too lost in their own thoughts, or in the message of the song, to speak much. Mostly, they just watch the majority of the balloons drift upward out of sight. Some balloons, suffering from helium deprivation, don’t make it skyward and catch on the fence next to the pavilion or drift into the parking lot next to the fieldhouse and go down there. I like to think the messages drift up just the same. I declined a card to write a message on and on my way home that afternoon, I realize that might have been a mistake. It seemed like such a catharsis for the people around me. 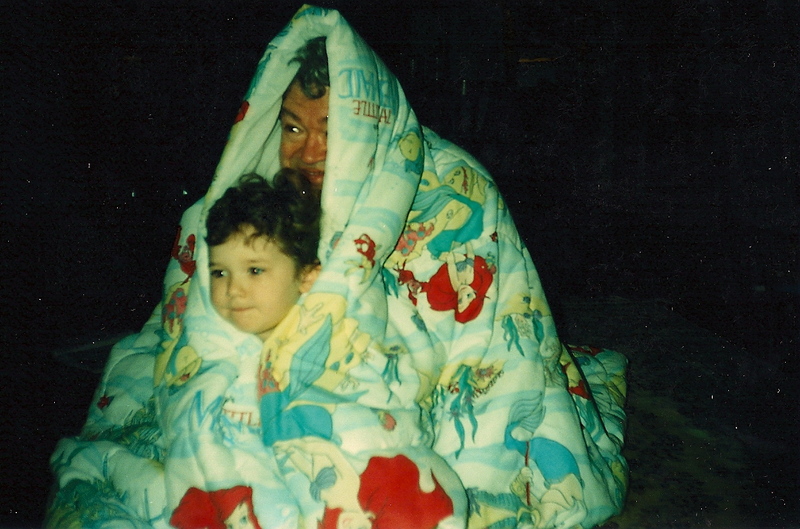 My grandfather died nine years ago and, as much as I hate to admit it, I’m still not as “over it” as people think I am. 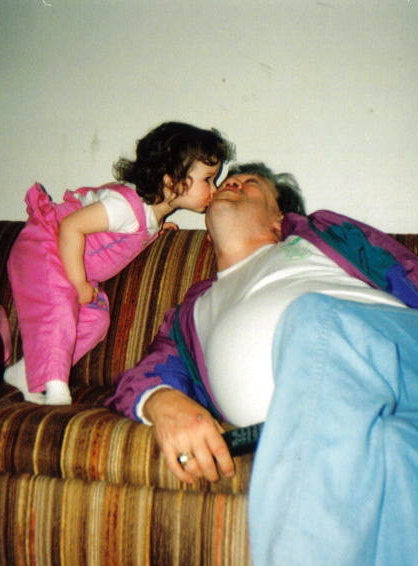 I think about what I would have written, what I would have wanted him to know if he were here. He’s missed so much of my life and had so many high hopes for it that it seems unfair for him not to be able to know what’s going on now. Maybe one day, something like this will come along again and I’ll have the chance to remedy that little mistake. I have to admit, I feel bad thinking this way. These people suffer, and will continue to suffer, so much more than I do, and the thing I drive home thinking about is still myself. Perhaps the event lent itself to more introspection by those who were there or maybe I’m just feeling guilty about not bringing myself to fill out a card because I thought my grief wasn’t worth it. I don’t know why this is. Is anyone’s grief more important or meaningful or appropriate than someone else’s? My grief is mine and their grief is theirs and it hurts just the same, doesn’t it? We all feel grief differently. We all cope with grief in different ways. Some of us grieve publicly, holding events to facilitate the grieving and give others a place to remember and grieve, too, allowing others to grieve with us. I admire these people, because the strength to let my emotions show where others can see them is something that has always eluded me. Others speak to therapists, trying to work their way through feelings that were, perhaps, never really meant to be dissected. Sometimes, it’s best just to let yourself feel it, rather than to analyze it. Others, like me, grieve alone, behind closed doors, ashamed or unwilling to let people see us cry. How can it still hurt so much all these years later? Shouldn’t we be able to just shrug it off and get on with our lives? The answer to that question, of course, is no. I don’t pretend to have all the answers, but do know that events causing this much hurt can’t be simply shrugged off after a set period of mourning. I’ve asked myself over and over again and have come to the realization that pain that doesn’t abate is there for a reason and there’s something else to be learned from it – something else to be experienced. Maybe it opens up a way for us to feel more empathically the hurt of others, even if we cannot feel their pain the way they do. We can say, however cliché this may be, that we’ve been there, or at least, close by, giving whatever comfort those words hold to another who needs it. I’ll never know what it’s like for the Rector family. I’ll never know what it’s like for the other families that gathered there that day. All I know is, while I watched those purple balloons drift silently into the air, that hearts all around me were lifting with them. Through the pain and the struggles that come by muddling through the crushing feeling of loss, they rose for however brief a time to linger with the ones they were remembering. For that moment, pain was lessened as that contact was made. I don’t need a murdered loved one or a message tied to a balloon to understand that. So, I’m teaching Creative Writing now and I need a place to post this so my students can see it. I wrote this back in high school, so if it’s not great, I have improved somewhat. Anyway. With little remorse, he watched as the man’s pleading face disappeared from view beneath the dark waters of the Hudson River. The man had robbed him, and, to make matters worse, had not paid him in months. He had only got what was coming to him. The men ducked into the car and drove off into the mists of the harbor, away from their crime scene with nothing more than a pair of shoes to tell their deed. They weren’t ugly shoes – they just weren’t what Doc was used to. They were, however, more comfortable than many of his other shoes, so he wore them, but only around the house. His wife, Anna, knew better than to ask where he had gotten them, but she had her suspicions. She knew what her husband did for his living, even before she married him. She had thought she could change him, but had realized too late that change for Joseph was nearly impossible and it was too dangerous to leave him. He had an outrageous temper and would fly into a rage over the slightest thing. No, it was safer to stay right where she was and not ask too many questions. Doc was feeling pretty good about himself. His most recent enemy was successfully eliminated and had effectively become an example to the rest of the community. One of his men, Benito Marconi, told him just a few hours after Jim Lengston “disappeared” that he had been receiving payments of debts owed to Doc. After last night, people were somehow able to scrounge up the money to make their payment. That night, he sat in his study, reading a copy of A History of Western Civilization. It seemed an odd choice for someone in his occupation, but he had once had a potential career in the field of history and, if he had pursued it the same way he pursued crime, psychology. He was more well rounded than his competition, something that made him feel more confident as to his chances of ruling the city in the not too distant future. He was several pages into an intriguing section on the Roman Empire when the lights went out. He threw the book across the room and yelled out something untranslatable in Italian. He stood, waiting for the lights to come back on, assuming that the power outage was only a mistake and that someone would realize the error and flip the switch. But the lights didn’t come back on. The house was eerily silent at that hour. Everyone had gone to bed and there wasn’t even a candle burning anywhere in the building. He couldn’t tell if it was his imagination or if he really could hear it, a swishing sound, like waves crashing against the shore. He sat back down in his chair and listened, trying to discern where it was coming from. Several minutes passed and the sound grew louder. His heart beat faster and faster in his chest until he thought it would burst. What is this sound? The power wasn’t coming back on, so it couldn’t be the heating system. Is there a window open? Doc couldn’t tell if it was a trick of light of the full moon outside or his mind playing more tricks on him, but it appeared that a shadowy form was reaching up from the floor. The form turned into obvious arms then a head appeared from the floor. The arms were thrashing about, as if trying to swim, like there was a man drowning in the floor of his study. The apparition was floundering towards him, reaching out to him, grasping at his feet, which were still shod in the shoes he had taken from the man he had thrown in the Hudson the night before. What was his name, again? A face began to take form on the head of the specter. A face Doc began to recognize. The apparition reached for the shoes again and Doc pulled his feet closer to himself, debating whether or not to kick out at what he was certain was the dead man’s ghost. As the apparition came closer and began to reach farther and farther. A high- pitched whine slipped from Doc’s throat as he shrunk farther and farther away from the frightening image, and just as he was about to call out in terror . . . The lights came back on and the apparition disappeared. Doc looked around feverishly, still feeling the ghost’s presence, but the ghost had gone. I musta fallen asleep an’ had a dream. Yeah, that’s it, he told himself, standing up and stepping briskly from the room. All the next day, Doc jumped at the slightest unknown sound, any slight movement from the leaves on the trees. But that night, nothing happened. No horrific face gleaming out of the night to torment him, no unearthly apparition to haunt his steps. It was beginning to affect the way he led his employees. Whispers on insanity and mutiny were in the air. No one wanted to stay behind a mad crime lord. He had not set foot in his study since he abandoned the room and had even ordered his son to take the shoes and toss them into the room. He wanted nothing to do with any of it anymore. Nice shoes or no. Several nights later, he lay asleep in his bed, still trying to block out the thought of the ghost he had seen the night after he had sent poor Jim to the Hudson. He was fairly certain it was his imagination, but he heard the swishing sound of water again and the room grew cold despite the covers and warm night. The sounds of the docks swept into the room and he could almost feel the fog as he had when he had performed the deed. There was a presence in the room, he could tell! He looked over at the form of his sleeping wife. Could she not feel it, too? He didn’t want to turn over to see what it was he could sense coming closer every second. His heart began to race again. His breath was coming hard, now, and his chest began to burn, as though he were holding his breath under water. He could feel the ripples of the water surround him in his bed. He had to get out of there! He leapt from his bed and tripped over something wet and soggy in the blackness. He groped around on the floor for a few seconds, trying to find out what it was. He shrieked in terror when his hand grasped it! It was a shoe, covered in algae and slimy seaweed, the same sort that could be found all throughout the Hudson River! But that was impossible! The shoes had been in the study all week and he was the only one with a key to the room! He shrieked again and scrambled as fast as he could from the room. … straight into the Hudson River! If he had been thinking rationally, he probably would have survived. But in his crazed state, his mind had deserted him. Faces floated up to his open eyes from the blackness of the water. Faces he recognized. Faces of people he had sent to their graves for one thing or another – he couldn’t even remember why anymore. Their fingers reached out to him like the wispy tendrils of seaweed that floated all around him in the murky water, pulling him deeper into the cold, black depths. The next morning, there was a story in the newspaper. A local crime lord had drowned in a ditch near the banks of the Hudson River. The authorities assumed he had been drunk and passed out on his way home, drowning in the muddy water, but there was only one person who knew what happened. Anna Rossellinni stood at the kitchen counter, making a sack lunch for her son before sending him off to school. Her eyes fell on a small bit of green leafy plant on the faucet where she had washed her hands after cleaning up the soggy mess from the shoes the night before. A slight smile played across her face as she flicked it into the sink and washed it down the drain. Tags: advertizing, brand, coupons, Facebook, loyalty, money-savers, social networking, what do you think? After posts in my Exodus series an others about news events, I’m breaking from what I normally write (and, let’s face it, read) and taking a look at advertising. Specifically, advertising on Facebook. It seems that almost every company or business has a fan page on Facebook. Commercials on TV inform us that if we want more information on their brand of soap/crackers/detergent/soup/furniture/tomato sauce/kitchen appliances/etc., we should visit the brand’s Facebook page. Beside more information about each product or brand (what kind of information about tomato sauce do people need aside from the expiration date? ), the page promises tips on how to use the products, and, in the case of food, recipes. More importantly, though, most of these pages include coupons or online deals through the official websites that are only available to Facebook fans in the hopes that, now that we’re fans, we’ll be loyal to that brand of cooking oil and that brand alone, thereby ensuring a continuing base of consumers for the product. Except it doesn’t. Not really. I have a friend on Facebook who is a fan of more than 300 pages, most of which are brands and companies offering these coupon- or deal-delivering promises to fans. At least that’s why I assume she “likes” them. I can’t fathom anyone liking Wishbone salad dressing or Fresh Express (bagged) Salads or Hefty brand trash bags so much they would announce it to the world for any other reason. I have other friends who are fans of competing companies at the same time (Coke and Pepsi, Pizza Hut and Papa John’s, etc.). Why do they do this? It’s not loyalty — it’s coupons. This, of course, is more of a problem for businesses than consumers. These people are savvy shoppers before they’re disloyal customers. First, the question must be asked — Do the businesses really care all that much? Surely they have consultants who inform them this is happening. So what, if anything, are they doing about it? Just succumb to the fact that everybody’s in this game and do what they can to get someone to buy their products, one discount at a time? So . . . are you loyal to any brands or do you stick to whatever’s on sale? To what and why? What would it take to keep you loyal to one brand or product? It was Christian School night at Grace Baptist Church and my first Sunday as an actual employee of Heritage Hall Christian School, a ministry of my church here in Muncie. I was recently hired to work in extended care, a program for children whose moms and dads can’t pick them up right after school. Basically, I get to hang out with preschoolers for two and a half hours, three days a week. So far, we’ve discussed which snack food is better, pretzels or goldfish and why doing flips on the monkey bars in a dress without shorts on underneath would be a bad idea, so I can already tell this is going to be an awesome job. Before the preaching began, Dr. Ice asked all of the school’s faculty and staff to come and stand on the stage. He spoke about the high quality of the teachers standing around him to the congregation and the sacrifices many of them made to teach at Heritage Hall as opposed to other private or public schools in the area. After he was finished, he asked if anyone would like to give a testimony. Had I been prepared, I might have stepped up, but thinking about it now, my fear of public speaking would have probably gotten the better of me. I thought about what I would have said while listening to the preaching and, having missed my chance to say it publicly, I’ll go ahead and give the unabridged version here as I have no time constraints. I have been in a Christian school all my life, preschool on up. I came to Community Baptist School in the middle of second grade, where I met some wonderful teachers who honestly cared about their students and a few not-so-great teachers, let’s face it. I had two of those consecutively in elementary school. The good teachers didn’t just care about academics, they cared about the student — (in no particular order) what was going on at home, what was going on with peers, their relationship with God, etc.. That’s not to say there aren’t public school teachers who care about their students — there are plenty. Hallmark and Lifetime put out movies illustrating this fact every year. However, the fact that my father, who, at the time, was not a Christian and had a pretty dim view of organized religion in general, would choose to send his kids to a school he could barely afford tells me that the education I received from Community was vitally important to who I would (and want to) become. I was not always a model student and I think I was even less of a model Christian student. I didn’t really read my textbooks (and still don’t), I doodled rather than took notes, and procrastinated with everything but Creative Writing assignments. Desperate for friends or anyone to include me, I allowed people who pulled me back from following Christ to become my influences. Yes, even in Christian schools, there are kids who would rather jump into a pit full of rabid squirrels than live a life dedicated to Christ. In hindsight, I know this only fueled my issues with depression and gave me no desire whatsoever for the things of God or my grades. My closer friends (and I can use that term loosely now) seemed to have no practical ambition for life or love for God, and while I held (and still hold) tightly to my ambition of being a writer, I was losing my grip on the vital importance of Christ in my life to guide my future. I was still the good kid who didn’t get in much trouble and tried to keep my “friends” out of it (sometimes even dipping to being their lying alibi when people asked about something they were rumored to have done). I didn’t cross the line as far as rules went — I didn’t drink, didn’t smoke (anything), didn’t sneak out of the house under cover of darkness, didn’t run away from home like some I could mention, and my grades stayed up (aside from Algebra, and who can blame me?) — but the heart for Christ I once had and the desire to become more like Him wasn’t there, despite the prayers of my mother and teachers. I suppose I was angry at Him for one reason or another or simply allowed my “friends” to get in the way. To be honest, it was probably a mixture thereof. Towards the middle of high school, I found myself shocked back to God through a ridiculous cancer scare (more on that some other time). Let me tell you, nothing will bring you back to Him like the possibility that you might be meeting Him face-to-face soon. Of course, God had a plan for putting me through that scare (which was only scary because I let it go so long without telling anyone or getting it checked out — stupid, stupid, stupid). He was preparing me, not only for a renewed relationship with Him, but also the friends He wanted me to have, not only in the rest of my time in high school, but in the next step of my life — college. It didn’t take me long after arriving on campus to realize that I wasn’t in Kansas anymore. In fact, I wasn’t sure I was even in the same hemisphere. Up to that point, my life had been spent mostly in the protective bubble of a Christian school and semi-Christian home. My father cursed, sometimes violently, depending on his circumstances, but I wasn’t prepared to hear the profanity (both the words themselves and their regular and over-usage) coming from both my fellow students and the professors. My father drank, very responsibly, but I wasn’t prepared to for the stories I heard before classes started about people getting completely trashed over the weekends (despite having seen it on TV and in movies). I wasn’t prepared for the viciousness people felt and exhibited towards Christianity, through words and mostly passive-aggressive actions. Of course, I had been told that this was what the real world was. Teachers said it would be like this, the media showed it would be like this, but no matter how many people tell you about it, little will prepare you for having to go out there and see and hear it for yourself. While my Christian education didn’t prepare me for what I would see and hear at a state school, it did prepare me for how to handle it. I could go back to what I’d learned in Bible classes about who God was and why He deserved my devotion to Him. I could remember those who went through much worse than what I was dealing with and get encouragement from them. Within a month or so of starting at Ball State, I found my church home at Grace and found new friends there who have helped and encouraged me to continue in the ways which thou (I) hast (hadst?) learned. On my right ring finger, I wear my high school ring. While looking at the rings Balfour brings to campus every year with friends who are interested in buying college rings, I have been asked if I wanted to trade my high school ring for credit towards a college one. I’ve refused every time. Not because it’s the most expensive piece of jewelry I own or because it has my name on it in two places or because I’m stuck in my accessory ways. I refuse to part with it because it stands as a reminder of the people and the place that have given me the best foundation possible for the rest of my life. It wasn’t just the theology I learned in Bible classes and the Bible verse memory or the godly music we listened to and sang in school choir — though all of those are good. It was the examples of godly lives I saw in my teachers. One of the best teachers I had, Mr. Bradford (now Pastor Bradford thanks to a promotion to principal a few years ago), not only tutored me through Algebra I (which in a flurry of brilliance I followed up with Algebra II, much to my own frustration) but showed me joy, even through the midst of struggles. The man hardly ever frowned. Ever. Another teacher, one of the best and the hardest, Mr. Wellin, sang in the church choir and the enthusiasm and joy was abundantly evident on his face while he was singing. Mrs. Elliott taught four classes of English, one class of creative writing, edited the school newsletter and the yearbook, attended about 98% of the school sporting events while being a single mom to two teenagers. She had a laugh you could hear down the hall and we heard it a lot. None of this could have been possible without the joy of the Lord, which you can’t have if you’re away from Him. There were other teachers, in elementary, junior- and high school, who exhibited this joy, but I don’t have the time to mention them all here. And so, here I am, three years out of that school and working in another Christian school. I’m not a teacher. I’m not even full-time and I doubt any of the kids I get to work with will remember me down the road, but I hope these little 3-, 4- and 5-year-olds will be able to see at least a little of Christ in me as I continue the pretzel vs. goldfish debate. And I hope they realize what a gift they are receiving through going to a Christian school. This has been a long day for many reasons. Part of it is the heat and humidity (that I’m hoping leaves very soon) which I was out in for around an hour getting comments for a story about and watching the funeral procession for fallen firefighter, Scott Davis, who died fighting a church fire last Wednesday (see The Star Press article for more info. There are several, but this is one more about him. I will be blogging about this soon.) Part of it is the fact that Grace Baptist’s VBS has started and I’m starting to get worn down with the bus ministry as some of these kids have never been taught how to obey or anything about respect whatsoever. Another part that I didn’t really mention today and probably wouldn’t have to anyone unfamiliar with the situation if it weren’t for this blog is the one most on my heart right now. You see, ten years ago today, the world lost one of the greatest men you’ve probably never heard of. My grandfather, Don Daugherty. He led a simple, hard-working life — as simple as being the father of six could be. It’s because of him that I tell stories, both fictional and real. This was a guy who could tell a story that would capture my attention and imagination as a child (no easy feat, by the way) and could do so on command. I’ll write more about this one day and perhaps fix the problems with this essay when my brain isn’t so dead. Tonight, I’ll post an essay I wrote for an English class last summer about that night ten years ago when I was forced to look at and accept the fact that life isn’t fair and the ones you rely on might not always be there. It will probably go down as the worst night of my life. He was my grandfather – my mother’s dad – and he had been fighting this growing monster inside him for the three years it spent eating him alive from the inside out. He couldn’t fight any longer. There was nothing the doctors could do, and personally, I think he grew tired of battling with the tumors in his body. He was exhausted, both in body and spirit, and the only thing we could do was let him go. The day I hoped would never come, came and went without a whisper. There was no thunder and lightning or heavy rain like in the movies. The sun set just like it always did and rose again. We woke up the next morning, and the world still turned. Men and women went on with their lives and, in time, we would, too. But a part of me is still in that back room of my grandparents’ house where I watched him lying in that rented hospital bed in a coma, still and silent. Jeffrey Daugherty, or Jeffy, as my grandmother called him, was an uncle I had never met. He had died of a brain tumor before I was born. He would be my immediate family’s first experience with premature death. Another uncle would face the same threat, but survived a brain tumor, losing only the hearing in his left ear. We believe that, before his death, my grandfather’s cancer also spread to his brain. This was both good and heartbreaking at the same time – good because we had some time to get used to the fact that he was, more or less, gone before he actually left this world, but heartbreaking to watch him become more and more confused before finally lapsing into a coma in his bed in that tiny back room, painted an obnoxious shade of teal with white curtains that hung and billowed gently with the slightest breeze, like ghosts that stood, watching for another spirit to leave its body. And from the looks of it, his spirit was anxious to do so. His face was pale, kind of a yellowish gray from the disease attacking his liver. He looked like he was just asleep, but it was easy to tell he was sick. His hair, which he never lost through the chemotherapy treatments, was white and thinner than it used to be, but still wavy, just like always. He lay there motionless, like he was sleeping, and sometimes it was easier to believe he was simply sleeping. That he would wake up any time and everything would be fine and we could go on with our lives as if this cancer never happened. But the facts would invariably bring me back to reality. He was drifting silently away and there was nothing I could do to keep him here. I blamed the doctors at first. In 1997, my grandfather had had surgery on his intestines and in the process of the operation, the doctors had seen something of concern in his colon, but declined to do a biopsy of any kind. They barely mentioned the fact that they had seen anything. Trusting the medical professionals, my grandparents went home. 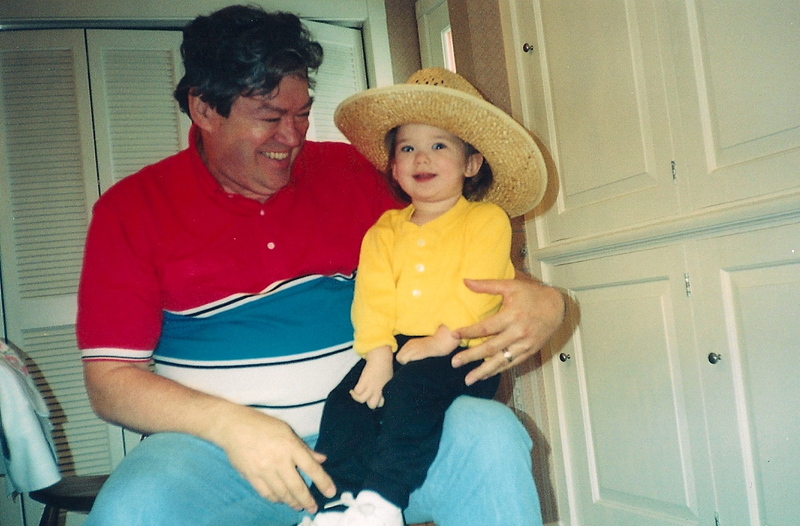 In 1998, he noticed a suspicious-looking spot on his face and, knowing the history of skin cancer, specifically melanoma, in our family, he went to have it checked out. It was then they found the cancer and, in the ensuing days, realized where it had originated. The mystery mass the doctors felt was, apparently, nothing to worry about had been cancer. It was to be the beginning of his fight with what had become stage four colon cancer. I remember clearly the hours spent in the hospital with him and my grandmother while he received chemotherapy drip by drip through an IV in his hand. The hours spent on his bed with him because the therapy made him too sick to be up and about. The obvious weakness every time I came back to Columbus after months back home in Indiana. I watched as the cancer took hold in his liver and lungs, despite the offerings of modern medicine. All I could do was stand by as doctors told us that the chemo was no longer working and as he was put on supportive care in an effort to make him as comfortable as possible. There’s no more powerful way of realizing that you are completely helpless in a situation. After his lapse into a coma, I rarely entered the room. He wasn’t really there. He had left weeks before. And, as an eleven-year-old, I could barely keep myself together when I was anywhere else in the house, much less his room. I had already spent years in depression and just as I was coming out of the worst of that, we got the call – the hospice nurses said it was the end and we needed to come soon if we wanted a chance to say goodbye while he was still slightly able to comprehend the fact we were there. I was the oldest cousin on that side of the family. I felt responsible to my fellow grandchildren to provide answers to the questions their parents didn’t want to answer. This gave me a good excuse to hide behind corners and listen to what the adults were saying – things they probably didn’t want us kids to know. Much of it was medical jargon, but even then, I knew the more technical the speech, the worse the situation. While there was life, there was hope, but that hope had dwindled almost completely until it was gone. No miracle was swooping in to save him, no doctor called saying there was one other thing they could try. There was nothing I could do. There aren’t really words to describe the feeling of utter helplessness when someone you love is slipping away from you and you can’t hold onto them to save their life – literally. Especially as an eleven-year-old, who comes harshly to the realization that she has no control over anything whatsoever, from something as traumatizing as the death of her grandfather to something as trivial as what would be served at dinner that night. No control at all. There’s something about a patriarch’s imminent death that brings out the crazy in people. My fully-grown adult aunts and uncles bickered for hours over something incredibly stupid, as far as I’m concerned, doing what they could to keep their children away from the argument to the extent that we weren’t allowed to come inside, even to use the restroom. The sad-but-funny part was the fact that they were ganging up on my mother over the decisions she had made regarding the way I was raised, saying she wasn’t letting me have any fun and that she was hurting me somehow. Honestly, I was more hurt that I couldn’t come in and use the restroom (a decision made by the aunts and uncles who claimed to have my best interests at heart) than the fact that my mother didn’t want me to go to see a particular movie with them. It was as though they didn’t want to believe we kids knew what was going on or what they were all fighting about. We weren’t stupid and we were tired of being dragged into the adult situation of this death then being treated like little children who couldn’t understand sibling squabblery. It was pathetically funny, the kind of thing you have to laugh at to keep from crying – adults acting like children, children having to act like grown-ups, the older cousins taking care of the younger cousins during these long bickering sessions, and my poor grandmother, trying to maintain at least a little peace with all of us. I’m sure it must have been difficult having all of us – five remaining children (three of whom had spouses present) and nine grandchildren – spending so much time at her house at such a time as that. What she did for peace and quiet, I’ll never know. I’m assuming, of course, she actually had time for peace and quiet. She was having to care for a dying husband – her fifth grade sweetheart who she thought she’d spend the rest of her life with, or at least another twenty years or so – and keeping a house full of guests fed and cleaned-up after. The woman was a superhero then, and remains so to this day. It’s taken a long time, but I think I’ve finally come to forgive the doctors who neglected to do anything about the tumor in my grandfather’s colon when they first saw it. If they had done something then, his cancer would have been discovered sooner, rather than it having to progress to stage four before anyone did anything. But doctors make mistakes, just like I do. Granted, I don’t usually make mistakes that kill people, but they didn’t know that was what they had done. For all I know, they never knew. As much as I think something should have been done to prevent doctors from making such a mistake, I don’t want my grandfather’s death, or anything else about him, to be something I remember with anger. There’s a saying that goes something like “When he dies, even the undertaker will cry.” There were a lot more people than just the undertaker crying at my grandfather’s funeral, though whether the undertaker did indeed cry is something I doubt. The undertaker had no idea of the person he was preparing for burial. He was such a vibrant person with a life story someone should write a book about. A boy from rural Kentucky who, through hard work and perseverance, lived to become the owner of his own software company. He was a son, a husband, a father, a storyteller, a fisher, a grandpa to, at the time, nine grandchildren, and to many others whose lives were touched by this man, he was more than I’ll ever know. 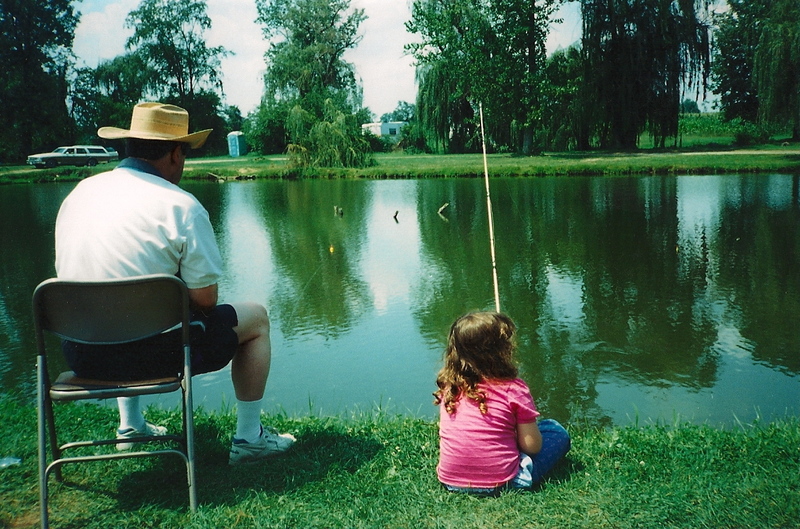 I want to remember the times we spent at a lake fishing (whether we caught anything or not) or the hours he spent making up stories for me. He is my original inspiration – for both life and storytelling. He’s the reason I tell stories. Partly in memoriam, and partly because he instilled a magical passion for telling stories that I wanted to keep alive somehow in myself and, maybe, in others through writing them down and telling them aloud when I could summon the courage to do so. There were many who saw him as an ordinary man, but not me. There was nothing ordinary about him. I can still hear the oxygen machine whirring on the left side of his bed. I can see the shapes all our shadows made on the weird-colored walls. I can still remember where everyone in the room was – for some, even what they were wearing. I, myself, was in my cherry pajamas, with the drawstring pants and the button-down shirt. They weren’t particularly comfortable, matching the mood of the long visit we spent there, basically waiting for him to pass on. There was an almost tangible tension I tried to ignore so people wouldn’t worry about me, but I can’t honestly say I didn’t want someone to ask. I was so lost without him. Like a piece of who I was – who I am – has been missing since the night of June 21, 2001. And I can’t get it back. More than 250 American flags hang somewhat limply in the heavy, humid May air along the pathways at Garden of Memory Cemetery in Muncie, Ind. They are flags that flew over caskets of veterans who have passed on and if you look closer, you can see little blue nameplates telling you who the soldiers were. I’m not there, necessarily, to remember a dead loved one or visit the graves of veterans. I’m there to cover a Memorial Day exhibit for The Star Press. 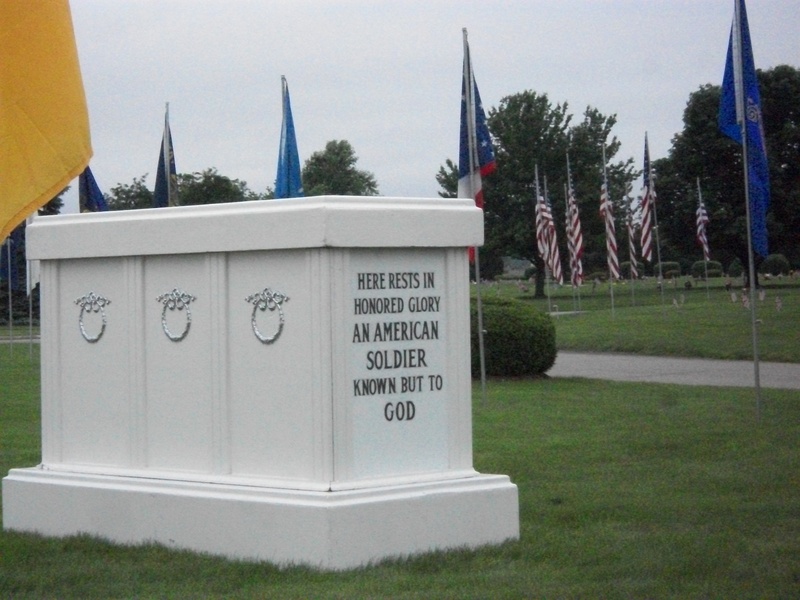 It was a first for this particular cemetery, a traveling replica of the Tomb of the Unknown Soldier. While the exhibit itself and what it represents is enough to bring a tear to my eye as I’m sure it does for many others, it’s what was said about Memorial Day and the way the man who brought the exhibit, one Shorty Geiger, and Joe Longo, the cemetery manager, reacted to what the day really means that got my waterworks running a bit when I sat down to write the story for the paper. Shorty Geiger lives up to his nickname. By my estimation, he stands around 5’4′ with a long, white ponytail and bushy beard, both streaked with reddish-blond hair. He smells of cigarettes and his voice is gravely, either from smoking or by nature. He is dressed from head to toe in blue denim that matches his eyes, with a black beret on his head that bears two pins and a feather on the back. The pins are symbols — one for the AMVETS, which he is a proud member of after his service in the Vietnam War (1969-1970), and another for the MIA/POWs. I wish now I would have confirmed specifically whether he was a POW himself, but from other things I’ve read about him and other thing he’s said, I’m inclined to believe he was. He’s been traveling around Indiana with the mobile Tomb of the Unknown for nearly 15 years now, ever since it first ran in the the Three Rivers Festival Parade in Fort Wayne. Geiger tells the story a little differently. What followed was a somewhat awkward silence while I waited for him to say more. He sounded like he had more to say, which he did, but not until another question was asked. These awkward silences are the worst part of my job, because I can’t quote a silence, even if that silence is loaded with words unspoken. I can’t put it into words for news copy, even if what’s said in that silence is what people need to hear the most. My next contact for the story was Joe Longo, the manager at Gardens of Memory Cemetery. He’s a very tan man, completely bald with a smile that could light up a dark room. He’s been running around all day preparing for the different events that would be going on around his cemetery for the holiday weekend. The stress and hustle of preparing for Memorial Day celebrations is no stranger to Longo, who has been directing the festivities for thirty years at various cemeteries across the country. He said, between the days of Thursday and Monday (Memorial Day), the cemetery sees more than 7,000 vehicles, sometimes bearing several people a piece, come through the gates. 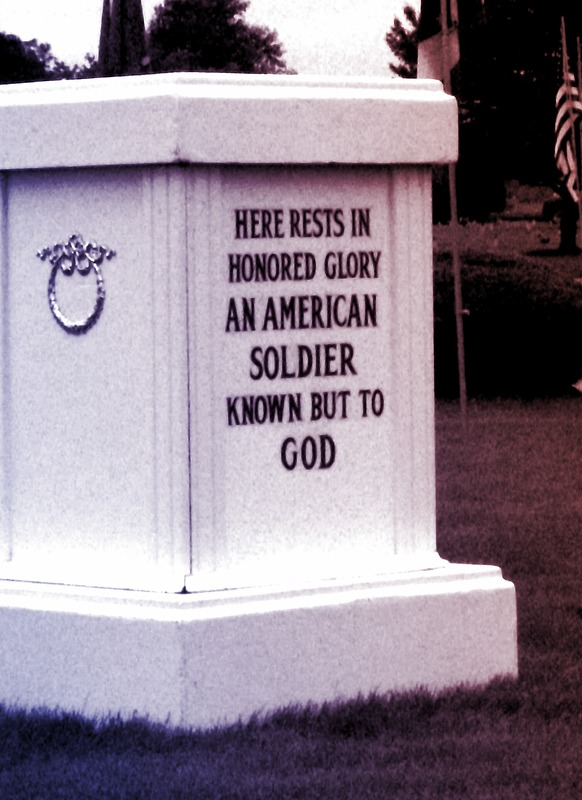 “A cemetery is where people pass away, but on Memorial Day, if everybody understands the definition of Memorial Day, it is where you’re honoring our veterans that have passed, either in war or in peacetime, but they’ve served our country. Memorial Day is when we come to pay honor to them at our cemetery,” he said. He told me that, between this and last Memorial Day, 89 veterans had passed. I’m assuming we’re talking about had-died-and-been-buried-in-Gardens-of-Memory, rather than passed in general. Longo is the son of veterans (he said his family can be traced back to the Revolutionary War) and even enlisted himself, but was honorably discharged soon after and didn’t see any active duty. His son is a student at Delta, with aims to join the Air Force Academy. Regardless of his acceptance, he plans to join the Air Force to carry on the family tradition. Longo said the most important part of events like these is the remembrance of loved ones who served in the military. Longo said they also respectfully retire (via burning) used flags at the ceremony as well. He said Shorty had the Tomb there last year and Longo asked if he could book the Tomb for this Memorial Day. I don’t think I could put this next bit any better, so I’ll let Joe do it. I know I’m writing this blog post a little late to remind you for today, but while you’re enjoying yourselves this summer in your pools or at car races or at the lake with your boats or whatever summer is for you, take some time to remember what allows you to have the chance to do these things. And thank a veteran and remember those who aren’t here for you to thank in person today.